Thank you for visiting. It’s 11 p.m. Comments are now CLOSED. I’ll pick and notify the winner on Sunday. After you are finished reading here, feel free to check out my other blog posts. Sew, Mama, Sew visitors, welcome to my crafty place! I’m a stay at home mom to my four kids and I’ve been married to Mr. TellBlast for sixteen years. I homeschool three of my four kids. After eight years at home, my oldest is currently enrolled full time in high school. I craft in my spare time. I am giving away a Travel Purse a la Michelle at the vintage sheet, which I was made aware of through daily visits to the Sew, Mama, Sew blog. My travel purse is 5 7/16″ high and 4 1/2″ wide. The handle is 23 1/2″ long. 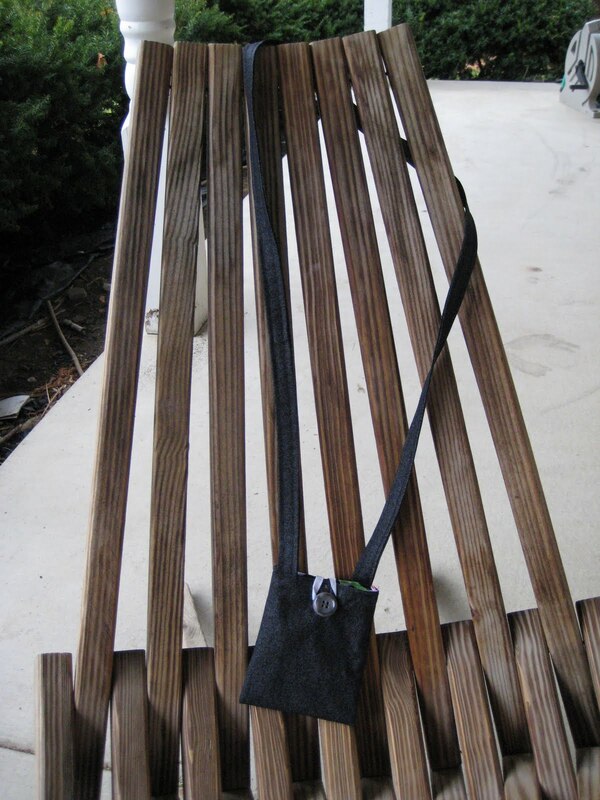 Worn across the body or over the shoulder on one side puts the purse right at my hip. It is made of quilting cotton. Brand new, never used! I swayed a little from the tutorial while making the pocket. I turned the edges under and used a straight stitch to create a cleaner look than a zigzag. The pocket is perfectly handy for a credit card. If your card is always lost and you take forever to fish it out, this pocket will be great for you. The lining fabric was taken from my 9yo daughter. She thought she’d like to handsew a 9-patch quilt around April, but she just isn’t ready for the amount of precision needed to make a good-looking block. And then she was given a brand new sewing machine in September. So hand stitching a quilt isn’t her cup of tea any more. (But she does like red hibiscus flower tea thanks to Ms. Kristie.) The button is vintage from my slowly shrinking collection. The outside fabric was bought special, just for this purse. Aw, how nice. To be awarded with this travel purse, you need to comment here no later than 11 p.m. CST on Dec. 5. The gift will be awarded on Dec. 6 to the person who answers this question best: Where will you take your travel purse? Please leave your email address if you are not a blogspot blogger so I can let you know if you are the winner. 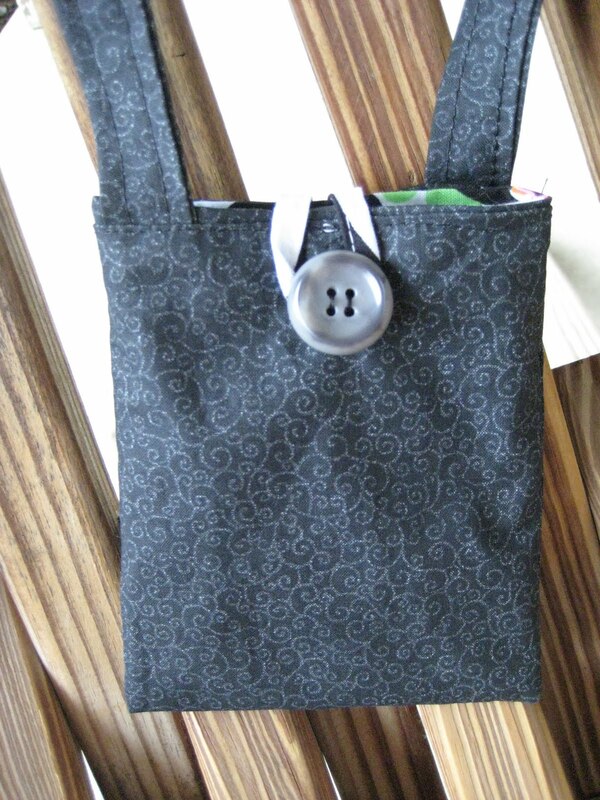 This entry was posted in crafting and tagged giveaway, sew mama sew, sewing. Bookmark the permalink. I would take this everywhere:) Right now my purse is a huge diaper bag and it would be nice to have something smaller for just me! Thanks! I would let my niece take the purse with her wherever she went! LOL for iPod, lipgel, little dolls, etc! Too cute! If I win I would share this with my MIL she is a world traveler. I know she'd love it. My mom has pulmonary hypertension–that would be a perfect purse for her to keep her pump in! Merry Christmas! I will take my travel purse to mom's night out and to park play dates where the car is close and diapers can stay in the car but cards need to stay with me. It will be great since it will leave my arms free to play with my kids! I'd take it with me to Portland in March! i would take this purse to the zoo, museum, park, library…and everywhere else i go with my preschooler on our little mommy and me field trips. it may even make it to europe someday. i can dream, right? This would be perfect for my daughter to take with her as she studies abroad in January. And the material makes it wearable next to the body out of sight. I would take my travel purse to Christmas and gift it to my mom, who's been wanting a bag like this! Where shall the purse travel? Everywhere I go in my dreans and in life…for all its twists and turns. Thank you for your giveaway! Disneyland! Well, I wish. Maybe I'll have my niece in California take it to Disneyland for me? I corodinate a lot of our homeschool field trips. This would be perfect to keep all of the information I need on those trips close. With soon to be 4 kids of my own, it helps to be organized. I love the size of that little travel bag. On any given day, it would probably accompany me to my kiddos' school, the fabric store, dance lessons, piano lessons, gymnastics, choir practice, and maybe… just maybe, mind you… out on the town for a date night with my husband! i will take it to my niece because she keeps pestering me about making her something like that but i haven't had the time. you would soooo save me. This is a perfect little bag. I would take it in a box. I would not give it to a fox. I might lend it to a mouse. I would not let him take it out of my house. I would take it here or there. I would take it anywhere. I could take it on a train. I could take it on a plane. I would take it in my car. I would take it very far. I might take it on a boat. But I would not lend it to a goat. I would wear it in a tree. If I win it you will see. I would take it anywhere! I would take the travel purse to Austin when visiting my grandma. What a handy purse. I would take it with me to Disneyland later in the month, where I will be with my husband and two young daughters. Hands free accessories are a must! i'm planning a trip to paducah ky this spring – i will take it with me to the quilt show, and then hopefully on to germany for 3 or 4 weeks in august – hoping to spend time with the family there. Hi, I would take the travel purse on my trip to England that I'm planning right now. We are visiting my stepdaughter and her family (her husband is in the airforce and stationed in England for the next 3 years). Thanks for participating in the giveaway. To the library and grocery store for sure. We go away to swim meets out of town a lot–I would definitely use it then! Well I never go anywhere, but I'm trying to get my husband to go on a cruise for the honeymoon we never took when our ten year anniversary rolls around so I'd take it along for that. I would take any were I go out. It would hold my new Ipod. so cute, it would make a great item for my teenage grand daughters stocking. We are taking a family trip to Canada this summer. I would so love to take your pretty travel with me. Thanks for the chance. Oh so cute! And useful! I would use it to hold my passport on a mission trip to India in April. Cute purse, my daughter would fight me for it. I would take it on my girls weekend to Colorado, my daughter would take it to hers to Hawaii. Oh, that's so cute! Anything small automatically translates to cute, I don't know why. Thanks for playing along. I would take it everywhere. Oh my gosh, I really need this bad! I actually wouldn't use it right now for traveling (I wish), but for working. I work for a non-profit that helps children in our area. We work at all the sporting events, concerts, etc. The venues have super strict rules on what we are allowed in, we are usually searched, etc. We are usually allowed a small fanny pack which I don't own or something similar. Your travel purse looks perfect & it is trendy as well. Perfect! I will take my travel purse on adventures of all kinds! Perhaps a walk through the woods where it can hold tiny natural treasures? Or maybe we can travel to the sea and collect seashells together…and then we can go to the fair and save those fabulous ticket stubs….adventures of all sorts we shall take together…me and this wonderful little travel purse. We will have stories to tell! I would love to take it to Ireland! oh i really love this! thanks for the chance. I would take this everywhere! I just love it! Wonderful Giveaway. Thanks. I would love to have something smaller than my current purse/diaper bag. I'd take this travel purse wherever I travel! Some of my common destinations: Illinois (my home state), Connecticut (my husband's home state), and various places in Indiana (our current home). I'd take this bag whenever I go traveling! What a cute giveaway! 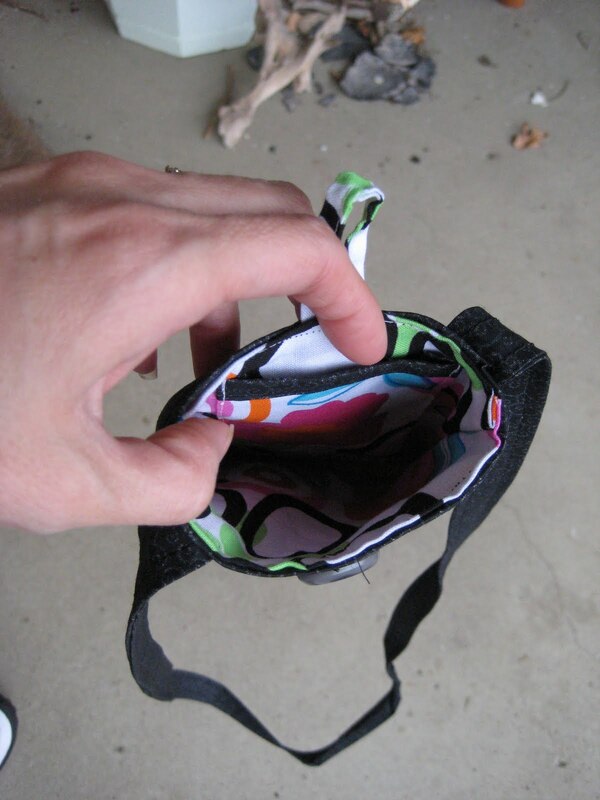 I would take my travel purse to the grocery store late at night – AFTER the kids go to bed! I have 3 little ones 5 and under (homeschooled also) and while I love them dearly, sometimes it is just easier to do my grocery shopping alone! I would take it on field trips with my girls. Hooray for homeschooling. Is it fun? I am sure it is work, but it seems very appealing to me. Anyway, I would take my travel purse on the many walks I take with my babe, and Italy or Hawaii, should I ever visit those glorious foreign spots where I have connections (yes, I know Hawaii isn't truly foreign).